1. 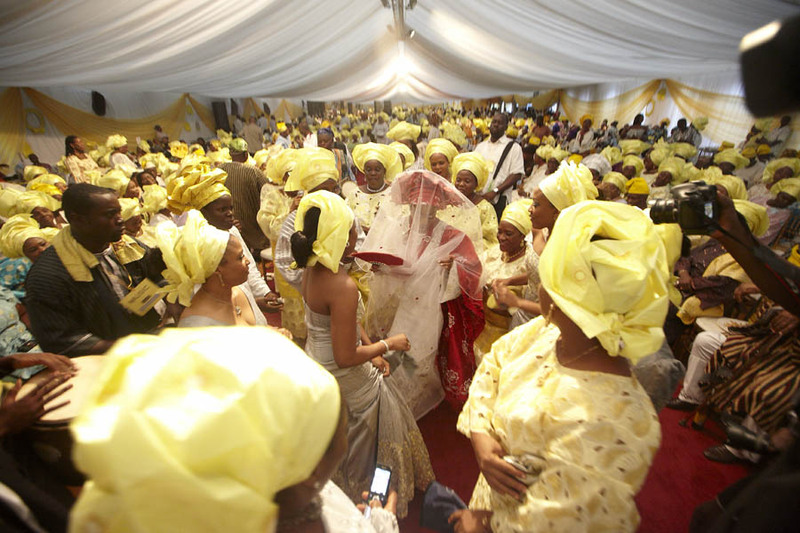 Asoebi – This is a common feature of many Nigerian weddings irrespective of location (abroad or local). Asoebi commonly refers to family and friends of a celebrant identifying with the celebrant by wearing a common dress theme or code. To ensure uniformity in the dress code, the celebrants sell the dresses to the participants at rates determined by the former. Prices can range from N5,000 to N100,000 (or even more) depending on the person calibre of friends who are willing to participate and the unique taste and fashion of the celebrant. This can be a drain in the pocket particularly for those who think they can afford to pay. Whilst the amount may seem affordable at first, it becomes a drain when the number of wedding invitations requiring asoebi starts to pile up. Mitigator: Your Budget: Yes you can budget how much you want to spend on Asoebi at any given month on quarter. Whilst this may sound too theoretical, the effect on your financial health makes it imperative. Another option may simple be to adopt a new principle..”Sorry I don’t do Asoebi”. 2. Joining a Bridal Train – I know a guy who had a friendship record of appearing as a best man nearly a dozen times. Now thats a great attribute as it indicates the high regards his friends place on him. The pitfall for this off course is that he may have had to buy a Suit 12 times. It’s even worse for ladies who have to sew dresses they probably do not get to wear again. Some couples are very demanding and will insist that you join the train warranting that you incur additional cost that you probably would like to wish away. Mitigator: For a guy, you could try as much as possible to repeat what you wear. If you attend wedding where the jacket is plain black or grey or blue then it is easy to repeat what you wear. But when you have to wear specially made tuxedos then the only choice you have may just be to choose the ones you can wear at dinners or banquets (if you ever get to attend any). For women, bridal dresses can be reused if you are lucky to get away with a trendy style that is not bespoke for a wedding only. Only other option may just be to opt out completely. 3. Fashion Expenses – Wedding ceremonies are also an avenue to test out all our expensive wardrobes and accessories. Dresses, Jewellery Shoes, Watches, hats etc. The problem however is apart from the fact that we always want to buy and own more, we may have also worn them a few times at social gathering prompting the need to go and buy new ones even when you didn’t really plan to. This is one cost that affects those who care to bother about what people think about what they wear. 4. Contribution – Being Nigerian is also being a personal who helps in times of need. It is in our culture to help one another and as such when wedding bells come it quickly follows a need to contribute monetarily to the success of the wedding. This can be done privately or through associations or committee or friends etc. Whilst this is a lofty action it can be a problem when you have to do it several times in the year. 5. Transportation Cost – Some wedding ceremonies require that we travel interstate or out of the country. These can be very expensive especially if it is at a location where you know no one and have to pay for a hotel accommodation. Ticket cost is also an added concern whether by road or by air. The thought of being away from your family and risk of traveling is also an unquantifiable cost that we have to incur. This may have been ok if we only had to do it once in a while, however these days of Facebook and Whatsapp, people work in locations far apart and can still interact fondly making excuses difficult to accept. Mitigate: Work and family pressures are usually good ways to avoid this cost. Some can also claim phobia to traveling as well. Only problem is that when you don’t travel your contribution can usually be higher. ← Are Female Leaders More Ethical Than Male Leaders?